hey paul can you explain how the fly fishing is going to work? are we going to buy the fly's like dry, wet and such?or only one type? what about the fly rod weight line #8 line and such or just a basic rod? what about tippet types? will we be able to buy 4X tippets or just start with a basic? do you have any of it modeled yet? if so can we get a pic? They fly fishing will start with one rod and reel, probably a 9 foot 6 weight, with a floating line, probably a 4X tippet, and just a few flies in the shop. I'll start with at least one dry fly, one nymph and one streamer. They'll all be general-purpose or attractor patterns for starters. The long term goal is to include a good number of flies and 3D fly tying so you can create your own. Along with that would be hatches by time, location and water type, so you would see the bugs on and around the water. You could use the zoom feature to get a good look at an insect and match the hatch. Add to that a range of rods, lines, tippets, strike indicators, etc. All of that is going to be a lot of work and take quite a while, but that's the long term goal. Right now I'm working on building the release version from the last beta build (the last update before fly fishing.) I started spending some time changing the way the skeleton moves to control the rod, so you'd have a wider and more even range of rod motion, which lead to bigger problems keeping the hands positioned correctly on the rod and reel. I spent several days reworking the way the rods/reels are linked to the skeleton to solve that. Basically what I thought would be an hour or two of tweaking rod motion lead to about a week of work, but the end result is better rod control and better looking synching between the hands and the tackle. I've got one more issue related to that to fix - in certain states the rod or reel mysteriously have their normals flipped- which is geek-speak for 3D surfaces facing the wrong direction. I have a lead on that one. I just want to get this set of changes wrapped up and solid so I can release this as a formal update. I love the direction you're taking it. My main criticism, at this point, is with the low-res models and textures. You can obviously get away with low-res models and textures at a distance but, for something you commonly see up close and personal, you should increase the tessellation so certain things look smoother and more highly detailed. The fly reel pictured above is a great example. Also, the rod guides, lily pads, and steering wheel are some of the more blatant eyesores. Even if you were to increase the tessellation on those sorts of things for now, it would make a big difference. Eventually, you could introduce varying levels of detail (LOD), where the engine would substitute lo-res proxies as the objects got farther away. The same could be done with textures (i.e., mipmapping), where you could use high-res textures up close, thus increasing the realism. Ultimately, you could add more advanced shaders with bump maps, diffusion, specularity maps, etc. I hope to have the simple fly fishing (one rod, line, tippet, plus a few flies) in December, and the full-blown version (multiple everything, hatches, 3D fly tying) sometime next year. I agree with Paleodust about the need for models with higher detail for the things that can be viewed up close. Using variable level of detail will allow for that, and it's in my plans for the next few updates. 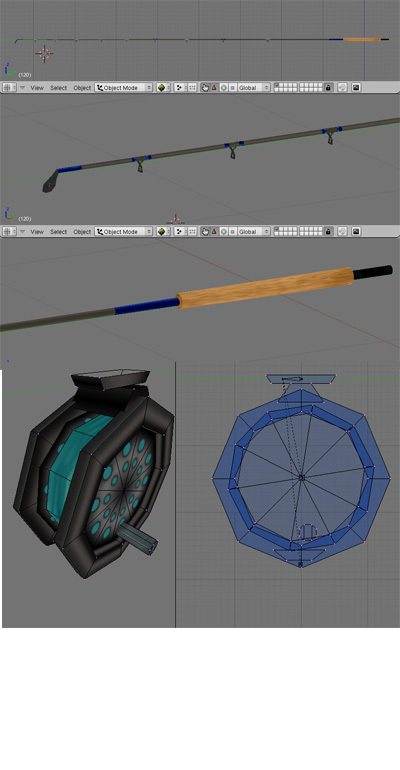 That will include much more detailed rods and reels, in addition to the people. I plan to greatly increase the number of polygons on the arms and hands that you see in the first person view, and use much lower poly versions for distant people and objects. By drawing less detail in the distance it frees up the time for greater detail up close. I've just started working on that this fall, and the brown trout in the current beta update use two levels of detail. Find one in the shallows where it's easy to see, then walk about 150 feet away and use zoom to look at it. You'll see the very low polygon version then, but unless you do something like that you're not likely to see the difference in anything other than a faster frame rate. It all looks good so far, but I am hoping that fly-fishing is not limited to river and trout. I am looking forward to landing bass, bluegill and trying for pike on the fly. Feathered frogs and furry critters would only add to the fun. Good point. I'll make sure to include some warmwater flies, like a bass bug, pike streamer and panfish popper. PS - Still working on the annoying matrix issue. I've found a workaround that fixes the inside-out rod (make the model double-sided, which takes a little longer to render but will always look right) but there's some new quirky things going on in the rotation of the reel depending on the pose. When this is resolved I'll finally release this update. I'm shelving the code I wrote to use the transformation matrix to align the rod and reel with the hand. After weeks of messing with it that method seems to introduce more problems than it solves in this case. I'm working on updating the installer and testing the latest build. I have every intention of releasing this update this week... Sorry it's taken so long. Paul. Sounds great. Sorry you had to spend weeks trying to solve that issue. I know you are passionate about fishing and about having this game be as close to that as you can make it. I don't see the need for you to apologize for it taking a little longer. Looking forward to all of it. i haven't seen it done so far so I'm wondering if we will see it would be cool to have a line for more shallow areas. what about the different sink rates or are we just going to use one type of sinking line? Any engine/graphics performance enhancements that allow for smooth, responsive casting (either via mouse or Stix (or even Kinect!)) will be greatly appreciated. Edit: for folks w/ older hardware. . .
Edit 2: I just read through a bunch of old posts and see it looks like you might have already done as much as you can on this front. I've found that I have to turn down draw distance and vegetation (both) to 50% to get FPS around 16-20 (I'm testing the new demo). Regardless, I'm still looking forward to the upcoming developments for this game.